In this swap you're going to be making a snail mail flip-book. You'll need to get your creative caps on for this one! This is more than your average letter! They are either a large sheet of paper folded in half, into 3 pages or however many times you can without it being too small, or pages stuck together with tape so you can have multiple pages. They contain a letter (either in a pocket or tucked in creatively somewhere), pockets, decoration, and goodies for your pen-pals. They are usually over 5 by 5 inches (when closed) but other than that sizing is usually up to the person creating it - as long as it is not to small and not too big. They also don't have to be the same size length and height. The way you decorate it is completely up to you! A lovingly made, decorated snail mail flip-book. A handwritten letter. About 2 sides of A5. (5.8 inches by 8.3 inches) or equivalent. Needs to have some goodies, (things like stickers, washi samples, little notebooks project life cards, embellishments, ephemera, basically anything that can fit in your flip-book!). It does not have to be profile based so you can start making it now if you wish. Rating requirement - 4.99. Newbies with well filled and detailed profile are welcome. No one with current 1â€™s or unexplained 3â€™s allowed. I will look at everyoneâ€™s profile and rating before assigning partners and reserve the right to ban anyone I feel is a bit dodgy or do not meet the above. Just a reminder to newbie swappers to make sure they have a well filled and detailed profile! For example - a good chunk of paragraph in each section. Although this is not a profile based swap, a nice detailed profile helps me weed out flakers. If you need any advice regarding profiles do join the Newbie Helpers group. I am sorry to say that I will ban those that don't meet these requirements - even if you have created you swap. Any questions please let me know! Thank you! I'm really looking forward to creating this flip book! I've already prepared the book and have chosen papers for three different palettes! 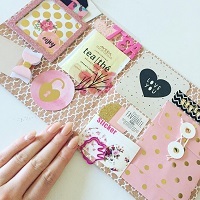 I've created little pouches, decorated envelopes and have started to gather goodies! I look forward to doing lots of these... I've not really thought about what I'll receive... I just want to make them!! Question: I'm new to this. If I make a tag that reads "Favorite things", do I list MY favorite things ? Or do I leave it blank for the recipient to list HER favorite things? P.S - there is no right or wrong way to create a flip-book. So long a it flips open, has a letter and a few goodies you're good to go! The possibilities are endless!! Tutorials can be a little confusing since they may not be all completed, (favourites list might not be filled etc). I suggest looking at the Flip-book shares on Youtube - the ones that people have received, to give a clear idea of what to expect as a lot of the creators who do tutorials make in advance and may not have a recipient in mind. I did my flip book by taping two card blanks together, mine was into a three way fold, but you could do any way, and decorating with what I could find. I find the card less flimsy than just using paper, even though it is a bit more expensive on post. When are you doing another one? @cathreus - this swaps partners are now assigned. But there is another Snail mail flip-book swap up hosted by another swapper. @teddygirl - I've sent you a message!